Georgia 400 is a major north-south freeway from Interstate 85 in northeast Atlanta at Pine Hills north to Coal Mountain and Georgia 306. The section between I-85 and the Perimeter Highway (Interstate 285) was tolled at a mainline plates between Exits 2 and 3 until 2013. The remainder, Turner McDonald Parkway, was built as a free route. The 29-mile freeway doubles as U.S. 19. 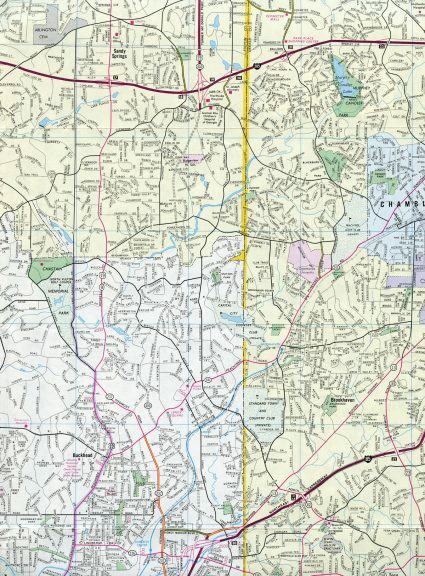 Originals of the Georgia 400 date back to a 1952 land-use plan that included an expressway paralleling Roswell Road north from Atlanta to Sandy Springs. Land acquisition for the Peachtree Connector, a four-lane roadway between I-85 and Peachtree Road commenced in January 1959. 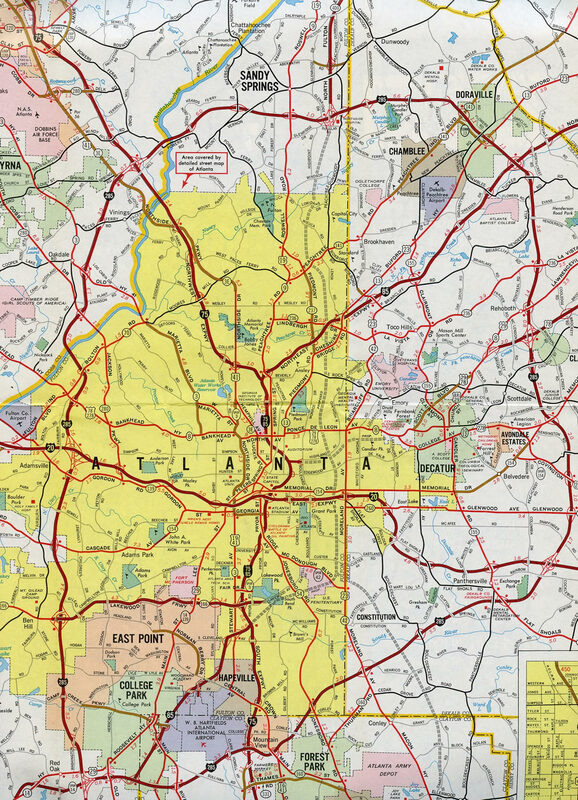 Renamed to the North Fulton Expressway by 1963, the proposed route from Lenox Square in north Atlanta to north Fulton County was estimated to cost $15 million. Construction on Georgia 400 between I-285 and Northridge Road was finished in 1970. During that time a consulting firm recommended the route south of I-285 be a toll facility and dubbed it the North Fulton Tollway. Earlier plans for Georgia 400 involved a north-south freeway stretching southward to I-75 at Stockbridge along what is today Interstate 675. The middle portion was also incorporated into an unconstructed version of Interstate 485 looping east from Downtown to Inman Park and north through Virginia Highland and Morningside to I-85. "'Essential' traffic corridor was 41 years in the making." The Atlanta Journal and The Atlanta Constitution, July 25, 1993. "Contract let for Georgia 400 widening." The Atlanta Journal and The Atlanta Constitution, August 10, 1985. 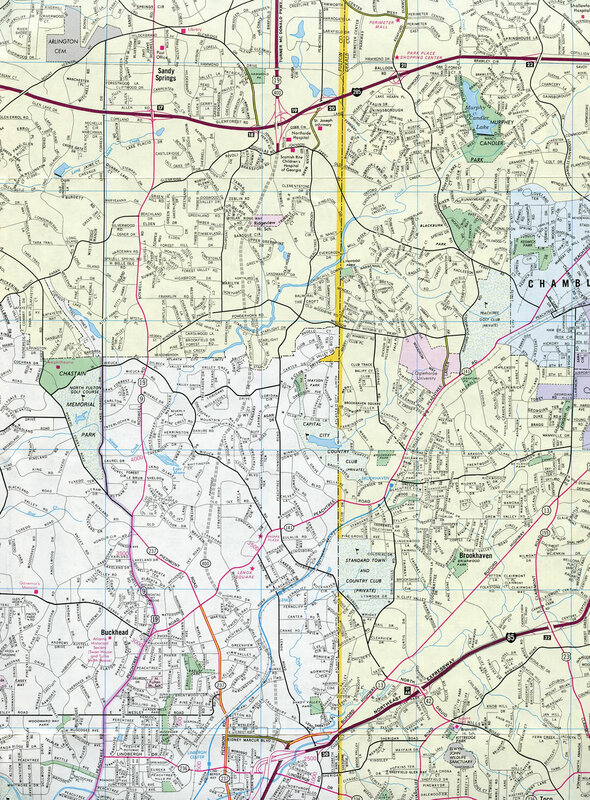 "North Atlanta Parkway still a 26-year-old dream." The Atlanta Journal and The Atlanta Constitution, October 28, 1985. "DOT pushes to make Georgia 400 extension a toll road - Congress.' approval would allow state to make up $120 million gap in - funding for highway." The Atlanta Journal and The Atlanta Constitution, December 27, 1986. "Funds ruling has killed Georgia 400 extension, opponents say.' approval would allow state to make up $120 million gap in - funding for highway." The Atlanta Journal and The Atlanta Constitution, July 17, 1987. "$15 million sought for Ga. 400 extension - DOT raises toll to lower fund shortfall." The Atlanta Journal and The Atlanta Constitution, August 20, 1987. "DOT Opens Bids On Bridge for Ga. 400." The Atlanta Journal and The Atlanta Constitution, October 22, 1988. "Court Order Blocks Work On Ga. 400 - City Must OK Extension Before State Can Proceed." The Atlanta Journal and The Atlanta Constitution, January 20, 1989. "House OKs Bill to Allow Road Plan Measure Would Let State Build Ga. 400 - Extension." The Atlanta Journal and The Atlanta Constitution, February 22, 1989. "Senate Passes Bill to Let DOT Proceed on Ga. 400 Extension." The Atlanta Journal and The Atlanta Constitution, March 2, 1989. "Council Votes Yes on Dome, Ga. 400 - Road Work Can Begin, Despite Suit." The Atlanta Journal and The Atlanta Constitution, May 16, 1989. "Another Roadblock To 400 Removed - Impact Statement Valid, Judge Says." The Atlanta Journal and The Atlanta Constitution, June 14, 1989. "Judge Rules Highway No Threat to Bird - Resident Fails to Prove Woodpecker Resides In Path of Georgia 400." The Atlanta Journal and The Atlanta Constitution, August 24, 1989. "DOT opens bids today on last major stretch of Ga. 400 road." The Atlanta Journal and The Atlanta Constitution, April 6, 1990. "Appeals court gives OK on Ga. 400 - Deals major blow to foes of extension." The Atlanta Journal and The Atlanta Constitution, June 26, 1990. "Ga. 400 digs in at high-rise - Tunnel will hold six lanes of traffic plus MARTA line." The Atlanta Journal and The Atlanta Constitution, May 13, 1990. "400 ramp to Glenridge Connector opens today - Johnson Ferry exit will also be closed." The Atlanta Journal and The Atlanta Constitution, October 31, 1992. 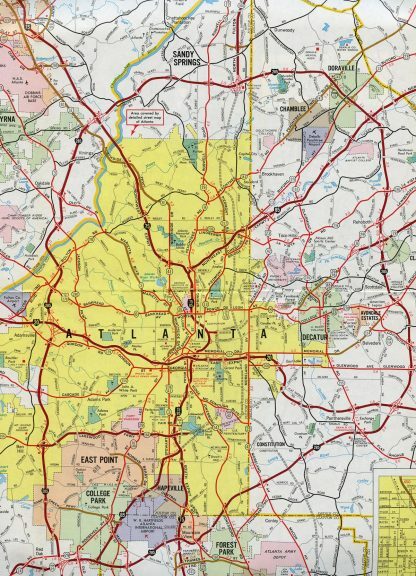 "GEORGIA 400 : GATEWAY TO NORTH ATLANTA - Just the facts." The Atlanta Journal and The Atlanta Constitution, August 1, 1993. "GA. 400 TIMELINE." The Atlanta Journal and The Atlanta Constitution, November 22, 2013. "'Groundbreaking' held for Mansell interchange." The Atlanta Journal and The Atlanta Constitution, September 13, 1990.